The past week has been a dizzying blend of radio appearances, interviews, and preparing for an appearance this week on a large CBS-TV station morning show later this week – Good Day Sacramento. More about that soon. 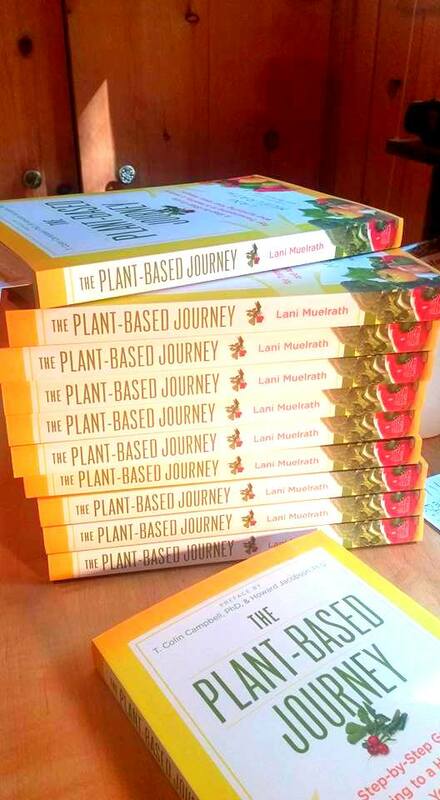 I’ve also been busy signing copies of The Plant-Based Journey. The stack of ten books pictured above was specifically destined for the library at MUSE School. MUSE is featured in Journey (pg. 16 – 17) as the brainchild of Suzy Amis Cameron and her sister Rebecca Cameron as a progressive learning environment focused in part on sustainability – their school dining area has been progressing to 100% plant-based! This is in no small part due to the fact that Suzy, her husband, film director James Cameron and their family have been eating plant-based for a several years due to the deep impact our food choices have on the environment. I very excited about Journey being a resource for staff, parents, and students at MUSE School! Though my calendar is a mess (I prefer working on the old-fashioned kind, paper with big box windows, full of writing that only I can seem to decode – and sometimes not even) and it’s been harder to squeeze things in, I cleared the deck for the opportunity to meet up with my friend and esteemed colleague Howard Jacobson. Howard, you know, co-authored the Preface to Journey with T. Colin Campbell. I feel forever in their debt, as the Preface stands alone as a great piece of writing. I tell them every time I read the Preface to Journey I want to go out and buy a copy – even though I already have one! So when Howard suggested we meet for a podcast to publish in celebration of the official release of Journey on September 15, why of course I said yes. And he even scrambled to get this formatted and up on his illustrious Plant Yourself Podcast page in time to beat the release date. “Her latest book, The Plant-Based Journey, to which T. Colin Campbell and I have the honor of contributing a foreword, comes out on September 15, which is tomorrow as I write this. She’s offering a bunch of bonuses as incentives to pre-order, so if you’re an early listener to this podcast, you still have an opportunity to make your online purchase and grab some goodies. Pop on over to the podcast page HERE – you can listed right on the page, or do as I do – download to your computer, upload to ipod or audio, and listen on the go. This podcast couldn’t have come at a better time for me. I am one of those people who gets so down on themselves for any shortfall, and then I feel bad for days. Your matter-of-fact response, easy laughter, and relaxed yet confident attitude have made all the difference for me today. What a blessing. Congratulations on your book coming out and I can’t wait for my copy to arrive! How nice to meet you and don’t you love it when that happens with perfect timing? I’m glad the podcast came at a good moment for you. Thanks for your note and be sure to let me know when your copy of Journey arrives!